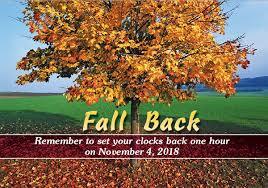 It is time to Fall Back! You are here: HomeLandscapingIt is time to Fall Back! Remember, Daylight Savings Time ends this Sunday, November 4th at 2am, so before you go to bed Saturday night, move your clocks back 1 hour. Remember to change the timer for your landscape lighting. You will be coming home to darkness around your landscape if you forget this when changing the other clocks. We have all heard this one before, because it is so important and easy to do, so please take the few minutes needed to test your smoke detectors and carbon monoxide detectors and replace the batteries. In the Fall, switch the direction of your fan to clockwise which will help pull down the warm air that gets trapped near the ceiling. Do you plan to use your fireplace this winter? It is a good time to wipe down the walls and clean out the ash. Maybe consider calling in a chimney sweep to inspect the chimney and clean the flue so you are ahead of the game for winter. Replace the filters in your heater and air conditioner. Also, consider scheduling a service and maintenance on your system. Like your car, regular maintenance of your hvac system will help it run better and last longer. Do this every time you change the clocks to promote even wear.